(Phys.org)—Recent announcements on the Raspberry Pi site had two items on the topic of cameras, with the November 23 announcement of a camera board demo of the upcoming Raspberry Pi camera module and on November 22 with announcements of who won the Foundation's summer coding contest. The Raspberry Pi is a credit-card sized computer board that plugs into a TV and a keyboard, also described as a miniature ARM-based PC. The twenty-five dollar Raspberry PI camera board, which was shown at Electronica 2012 in Germany, is to be available early next year. RS Components performed the working demonstration of the camera board. The prototype was mounted to a sawed-off broom handle secured with tape to a Raspberry Pi housed inside a transparent plastic case. The camera has a 5 megapixel sensor, and can record 1080p H.264 video at 30 frames per second, according to the announcement. Raspberry Pi's spokesperson said, "We're hoping to get these ready for sale in the new year, all being well, at a price of $25." She advised Pi fans to keep watching the space for updates. It should be noted that the camera board is a prototype of the production model. There is a way to go before Raspberry Pi can send it out to manufacture. For one, "We need to be sure that that big ribbon cable doesn't emit any forbidden electromagnetic radiation," she said. A small mount will be made available for the camera. She also said that a display board will come to market following the camera board. But what's the big deal about a Raspberry Pi camera board? Rob Bishop, a project engineer at the Raspberry Pi Foundation, said the board will allow Raspberry Pi customers to cheaply add video input to their projects, for anything from robotics to home security systems. As for the contest winners, the news is a reminder of why Raspberry Pi was offered up in the first place as a cheaply priced, barebones computer, the size of a credit card, to get young people interested in programming. A twelve-year-old who used his Raspberry Pi to create a time-lapse camera won first prize for the 13 and under category in The Raspberry Pi Foundation's two-month long competition. The winner, Aaron Hill, wrote pySnap, which won him a cash prize of $1,000. 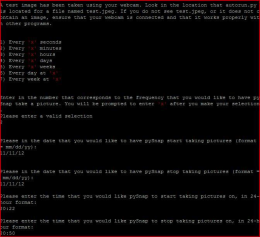 pySnap is a Python application for doing time-lapse photography. Although originally created for the Pi, it can work on any Debian based Linux distro. The software allows Pi owners to connect a USB camera to the device and fine-tune the interval at which it takes pictures. Beware of the Pi, it does not function correctly due to designers that ignored high speed design rules and did stupid things like place the IO chips clock crystal right beside the USB lines. They ignored the IO chip makers design requirements when board layout was done. The Pis USB ports are not standard-compliant. they do not work with simple wireless keyboards and mice due to faulty design that makes the USB ports crash due to RFI.